Interior Swag: Somewhere I have a family picture taken from the 80's in this restaurant, when it looked a heck of a lot different than it does now. 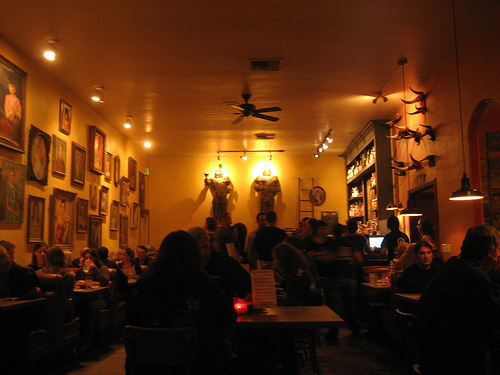 This old amazing hole-in-the-wall has been replaced with wall-to-wall funky art, loud music, and killer drinks. And I'm not going to complain about it. Ponce's has grown up with its neighborhood, attracting a steady stream of people for its incredible food and lively atmosphere. Service: I miss the bubbly waitresses with the off the shoulder blouses and ruffled skirts that worked there for decades (literally) but imagine they are kicking up their heels, drinking Coronas on a beautiful Mexican beach. The current staff is all business but just as nice. Food & Drink: The food is no frills Mexican and darn good. My favorites are the enchiladas and ground beef tacos. They also serve a kid's burger to cater to families, though I wouldn't call it a kid's place. And the prices are super reasonable. Go-Back-Again-Ness: Not a place for intimate conversation, but a great location for a festive night out.